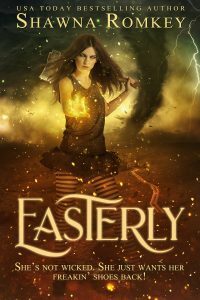 My latest release is Easterly, a retelling of the Wicked Witch of the East’s story from the Wizard of Oz. She’s not wicked. She just wants her freakin’ shoes back! She’s not wicked! She just wants her freakin’ shoes back! They call her the Wicked Witch of the East. They hate her for her magic, her power, her family. But Stazia wants no part of becoming the next Witch Queen of Oz. She’d rather go find a place with no magic where no one makes assumptions about who she is. Then someone drops a house on her and completely ruins her day. Not only do they kill her momentarily, but they take her ruby slippers and leave her for dead. She hunts the murderer-thief back to Kanzuss to get her shoes back. Without them, her magical energy and her life energy are slowly draining away, not to mention she’s trapped in Kanzuss and can’t get home. Without the shoes, she’ll be stuck in a sepia-toned world forever until she fades away into nothing. She’s not wicked. She just wants her freakin’ shoes back! A retelling of The Wizard of Oz with a tornadic twist. One click EASTERLY today to see this classic tale from the Wicked Witch of the East’s point of view!